Non-store retail – catalog shopping and phone ordering, plus door-to-door sales originally, now, increasingly, e-commerce – has been around for a long time (more than 110 years with a longer history of the “traveling salesman” or “drummer” prior to that). But for many years up to the start of the Internet age, store-based retail dominated in the United States. With e-commerce’s birth in 1995 (the Netscape web browser), there has been a steady shift to non-store channels. In April and May 2016, non-store retail passed 10% of all retail for the first time in at least a century (maybe ever), and the rate of growth is once again accelerating – faster than during the dot-com boom of the late 1990s. 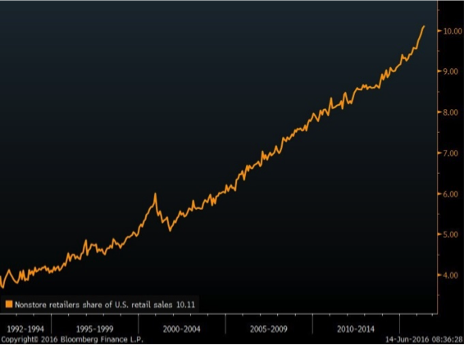 Doing some quick math on the current trajectory shown in the chart, non-store retail is adding about 1% point of total retail each year. So 15% by 2020, 20% by 2025, and so on. This is the essence of a major industry segment’s digital transformation and the ramifications are and will continue to be significant. Store-based retail isn’t going away any time soon. But it can be argued that it will continue to decline and that even to keep going in any form, it will have to adapt — and quickly. Waiting out long depreciation cycles on real estate is a recipe for empty malls and shuttered main streets. So what might a digital transformation plan for store-based retail look like? Embrace omnichannel. Unless you sell something that can only be delivered physically with the customer present (gasoline is the classic example) or where efficiency or environmental constraints demands in-store service (haircuts, perhaps) you’ll have to be able to serve your customers wherever and however they want. Even when you don’t have to, you should embrace a continuous customer engagement model and the data analytics and service optimizations that continuous engagement make possible. Invest in you customer’s success. If you have rich, but not invasive, insights into your customer’s lives you can design and evolve your products and services so that they enhance them. There will always be a fine balance between helping and overwhelming, but here again, engagement, data, and analytics will be key to getting the balance right, customer by customer. Enrich and expand the in-store experience. Make the store more than just a place to buy what you sell. What else might entice a customer to spend time in the store? 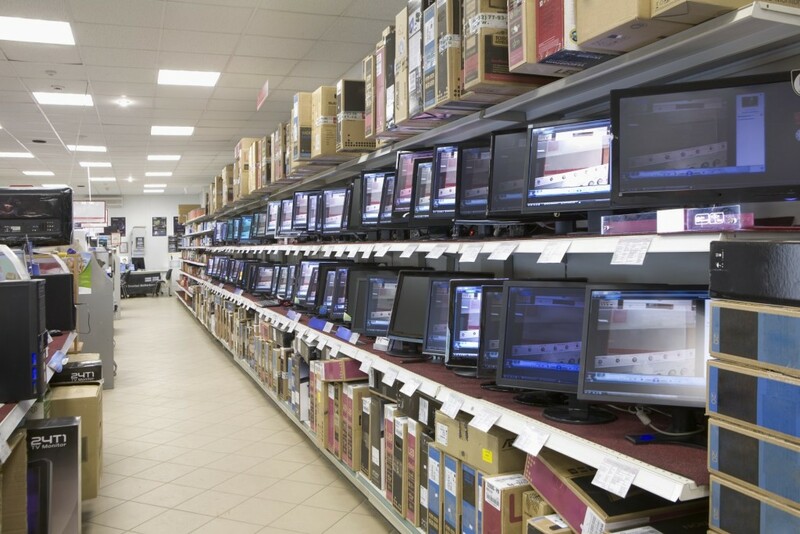 Where can in-store additions add convenience, comfort, information, or entertainment? Would adding refreshments, casual dining, or social gathering places improve the experience? Can you add personalized concierge services for child care, grooming, education, exercising? Incent customer loyalty. Although we’ve had in-store customer loyalty programs for decades, they have tended to be focused on financial incentives (discounts), rather than experiential enhancements. Maybe exclusivity, preferred access, or product curation services would be as, or more, attractive? Mine the data; experiment; above all offer your customers the opportunity to tell you what they want. Then listen and react quickly. Re-invent your supply chain: Most of the supply chain we have built up over the past 75 years is a ”fan-out” model, where products and service delivery flow from the “center” (manufacturing) through distribution to the edge (“store-based retail”). That’s efficient for inventory management if your replenishment capabilities are excellent, but it’s no longer sufficient in an omni-channel world. You’ll need both total real-time inventory visibility (capacity for services) and an efficient “mesh” of logistics for moving product and service capacity to wherever demand appears. All these probably means adding or acquiring new skills and technologies — building different relationships and richer data sets, and learning to experiment efficiently. Not impossible, but not easy either. There are signs that some early adopters are moving in these directions and learning what works and what doesn’t.